The Centre for Stewardship: Falkland Estate won the vote to host to our merry band of hikers last weekend, and fabulous it was too. Set in the idyllic village of Falkland in Fife, the estate takes in Falkland House, now used as a school, and around 1900 hectares of forest and farmland with a load of paths and trails, many of which are ideal for little legs and wheels. We got our rugrats there with the promise of conkers. I am aware I am giving away all my secrets here but Falkland Estate is conker paradise. We were are a touch early; the lower hanging ripe husks stripped bare and the higher fruits - which we managed to dislodge with a twelve foot branch and a blatant disregard for health and safety (don’t do it kids) – still white and soft inside. We still spent a happy hour kicking around in the fallen leaves for the shiny brown treasures. There is a public car park just off the main street by the library, which will afford the benefit of being able to peruse the large number of excellent cafes and craft, gift and art shops before you start. Or if like me, you are banned from shopping when the clear premise for a day out is ‘walking’, you’ll find more spaces down at the estate by following the road through the village. If you decide you really cannot live without a pre-walk browse, street parking is possible but this is a very busy area so please park responsibly. We’ve seen some shocking examples over the years, so spare a thought for the locals trying to go about their business in what we see as a period film set, but they see simply as home. The renovated Stables are the centre of the estate and where the Stewardship team are based. These are available for hire for a range of uses from workshops and craft classes to weddings. They have also recently opened an Information Hub which houses digital information in the form of a large touchscreen, leaflets, maps and more importantly, coffee, cake and ice cream. 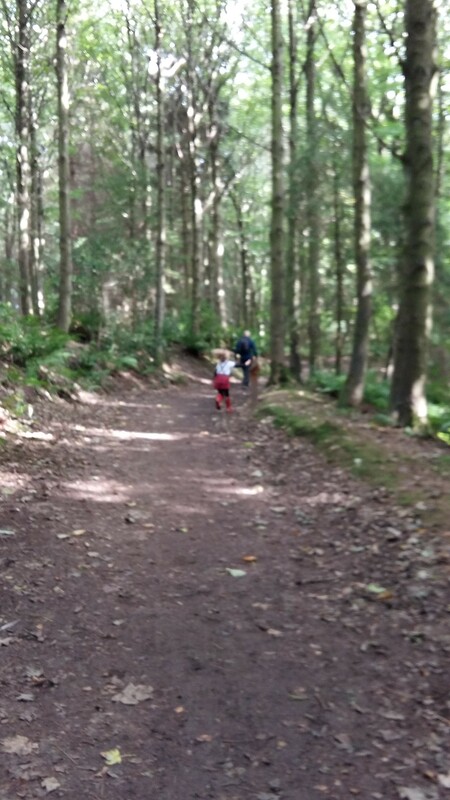 We settled on the Red Squirrel Trail, super easy and fine for little ones at only a couple of miles, but there are lots of walk options of varying length and difficulty. Pick up a detailed map at the Hub which is staffed by volunteers seven days a week. For the Red Squirrel Trail, there is a handy booklet to download in advance of your visit from their website, and a pencil and paper would be helpful if you would like to do some rubbings en route. Might have been handy if we’d followed that advice before we left but it didn’t spoil the enjoyment. Fairly flat with a few undulations, the path is a loop where you can pick and choose your route, always returning to the main drag. Ours were kept amused by eating under-ripe brambles, looking up to find the woodland faces hiding high in the branches and finding the next rubbing plaque. 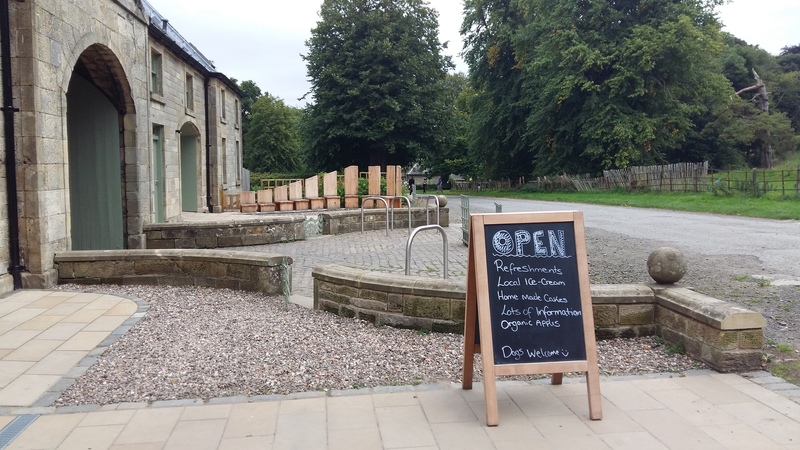 Coming out of the woodland on to an estate road, you could take advantage of the Pillars of Hercules café and shop, or if you are strong of will, follow the road just a few yards before it will deposit you back into the forest. Cross the bridge and come up next to open farmland and the estate orchard, the apples it produces for sale in the Hub. Returning back to the Stables, you could wander down to the river or into the village where is plenty to do and see including the impressive Falkland Palace. With a full afternoon of kids activities left to do, we settled for ice cream, but we will be back. 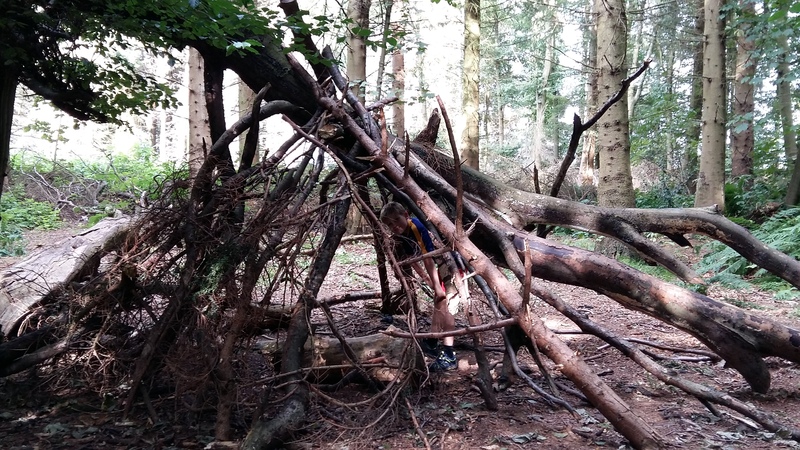 "As the Pied Hiker I'll be writing about hiking, biking and general outdoor stuff with kids. The truth about actually getting out the door with them, the tears, tantrums and the real and present danger of bodily harm when we run out of jelly babies. You might pick up some good tips on where to go and what to do when you get there. Or you may not. At the very least, you can remain secure in the knowledge that your parenting skills blow mine out of the water as the tales of screaming, bribery and copious amounts of post-walk gin unfold."